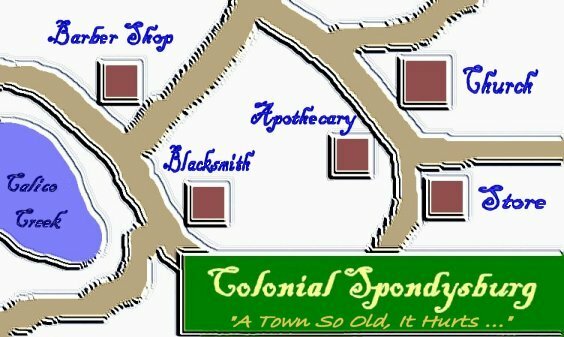 "A Town So Old, It Hurts ..."
Welcome to Spondyville's newest tourist attraction: Colonial Spondysburg. Now, we all know that the town of Spondyville was founded in 1875 by Uriah Stoop and Elias Fuselot, and that on the outskirts of town, there was recently discovered the remnants of an arthritic society dating back almost three thousand years, which has been called, (by me), 'archeologically significant', but few remember that there once was, some twenty-five miles or so north of where the town of Spondyville now sits, another town, a precursor, if you will, of Spondyville, that existed for a brief time during the Colonial era. 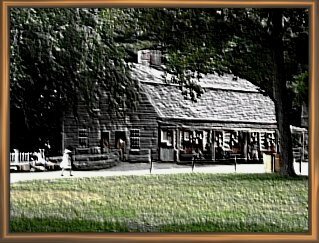 Old Spondysburg was first settled in 1648 by Moses Smitch, who built his farm on the edge of a Native American encampment, downstream from what is now known as Andy Tripzen Falls. Mr. Smitch, due to his skill as a distiller of alcoholic 'spirits', became quite friendly with the local tribe, later marrying one of the chief's daughters. Other European immigrants soon arrived, and discovered that the area, with it's fertile soil, relatively mild weather and flat, open plains, was perfect for farming, especially by those afflicted with 'the rheumatiz', as it was then known, because there were no hills to climb and very few blizzards to trudge through. By 1670, the population had risen to 43 settlers. 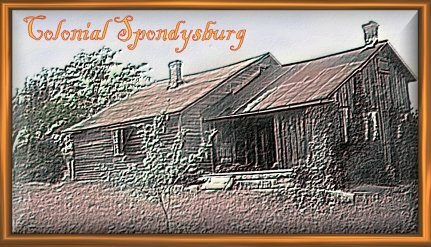 Old Spondysburg was incorporated as a village in 1685 and existed for another 87 years, becoming one of the few towns in the area, much less the country, willing to accept as permanent residents, people of all races and creeds, stricken with severe rheumatic diseases. Here, Native Americans, Americans of European descent, and Free African-Americans, lived and worked in harmony and arthritic stiffness. Unfortunately, around 1772, the town was devastated by a virulent Cholera epidemic which wiped out about 87% of the town's population. The remaining 13%, mostly old people crippled with rheumatism and poor eyesight, tried desperately to hang on, but eventually they all succumbed, either from old age or the ravages of their arthritic conditions, leaving the town to fall into disrepair and extinction. 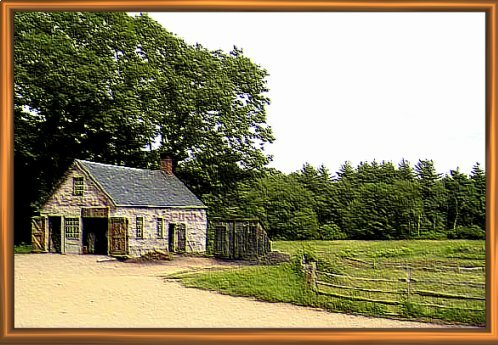 Decades passed, and Old Spondysburg, it's buildings decayed and abandoned and it's dirt roads overgrown with weeds and shrubbery was forgotten. Now however, thanks to the restoration efforts of the Marie Strumpell Foundation, with an assist from the Uriah Stoop Fund and a grant from the Fuselot Charitable Trust, Colonial Spondysburg is being fully and authentically restored to give visitors an accurate picture of what it was like to have, and to live with, Spondylitis in the Seventeenth and early Eighteenth centuries. 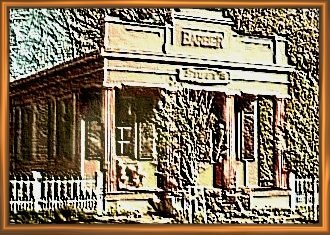 Naturally, the first building as you enter town is the barber shop, where most of the blood-letting and surgery was done ... with no anaesthetic. This building was situated on the edge of town, so the blood-curdling screams of the patient undergoing 'surgery' would not disrupt the other townfolks' enjoyment of life. 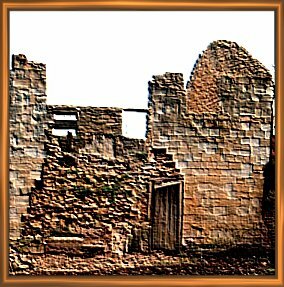 Not unexpectedly, the second building was the Apothecary, where curdled blood was sold as a salve to relieve the Villagers' psoriasis. Shave and a Blood-let, two bits. The Apothecary - Before Restoration.